But will he move out of Greece..he had offers before. Christos Tapoutos(2.07-SF/PF) has become a target for Zaragoza from Spain and Ludwigsburg from Germany according to pressaris.gr. The agent of the player informed him of the offers from the 2 teams and earlier in the week Tapoutos rejected an offer from Lebanon it seems. The article says that Tapoutos wants to discuss a possible offer from Aris first but also the monies owed from the previous seasons which come close to 100,000 euros and are a result of the deleterious management of the previous administration. 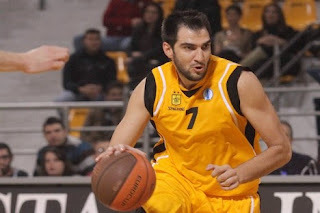 Tapoutos was the top scorer of Aris last season averaging 13.4 points 5.8 rebounds and 1.6 assists in 25 games in the Greek A1 league for Aris.